A method to build an image-based model from a high-resolution X-ray CT image has been proposed for crystal plasticity finite element (CPFE) analysis in this study. The grain microstructures of aluminum alloy were captured by X-ray CT in synchrotron radiation facility, SPring-8. An image-based model of crystallographic grains was reproduced by the proposed method, and the model was analyzed by CPFE. 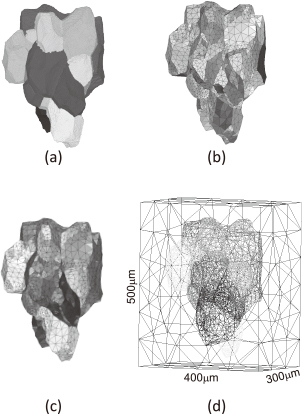 By this, it was represented that deformation analysis of a polycrystal microstructure considering actual grain shapes was available suggesting that the deformation mechanism would be made clear by the image-based CPFE with further work.